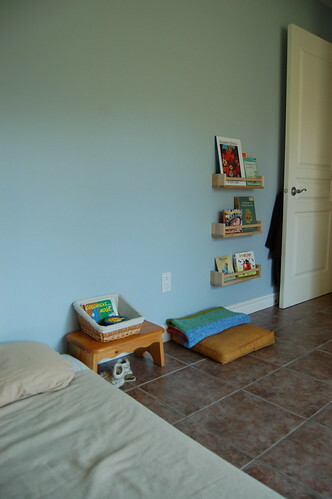 I was reading Kylie's words here, in her wonderful post about her son's room. And what she said struck me. She is so right! 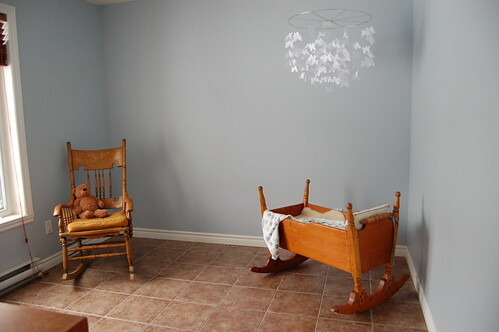 It is really interesting to see other Montessori inspired room, but to see it's evolution really talks a whole deal more. I want to share with you this evolution, and if you feel like it, join me along, and post, on your blog, the evolution of your rooms. 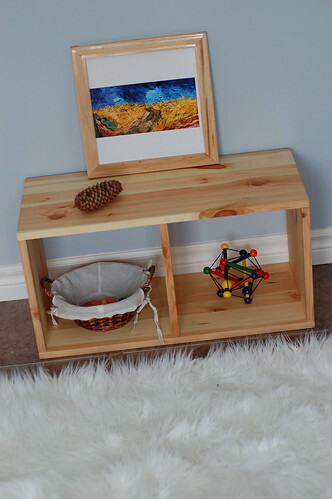 You are very welcome to leave a message here so that we have a big pool of really nice Montessori inspired bedrooms in evolution to look at! Please, join me for this show and tell, and don't forget to link to it by commenting. What a beautiful room! I love the baskets...how cosy! I love your son's mobile it is gorgeous. His room is perfect and I love his drums. What a lovely post. 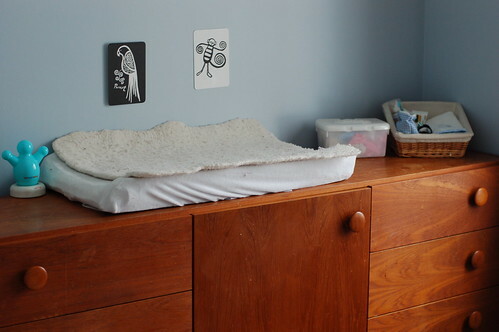 I didn't quite do a full 'evolution' post, but I showed my baby's rooms in his first two houses here: http://louiseallana.com/2011/06/29/montessori-floor-bed/. 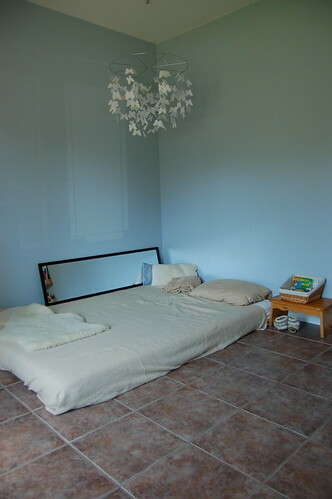 Everything else that features his room in words or pictures is here: http://louiseallana.com/tag/roos-room/. Now that I have a better idea of how to do this (eg take more pictures closer up!) I will revisit his current setup and blog about it again. thanks for all of your for your comments and most of all for participating! I hope many other will add to this as time goes. I'll surely go and check your post ASAP! 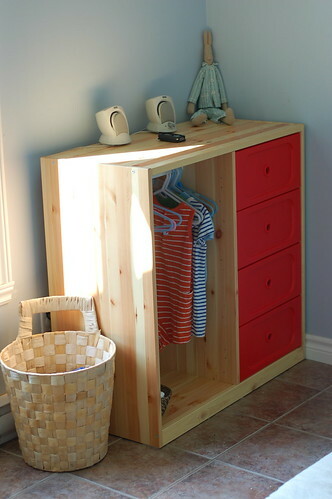 Is the clothing storage area from IKEA or handmade? It is SO adorable! 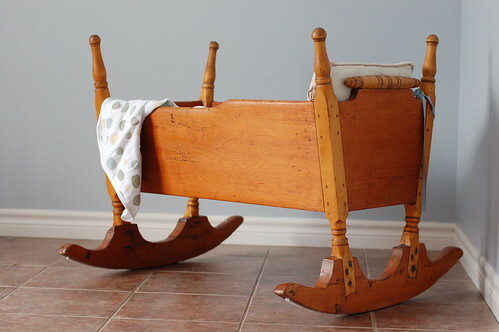 I would love something like that for my toddler. It is from IKEA. Thank you very much! 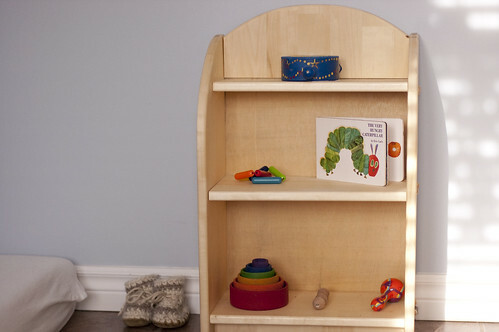 I love the Montessori closet! We have been struggling for a while to find something similar. Did it come as is at IKEA or did you make adjustments? Would you mind sharing the product name? It is the Trosfast line. When I bought the module, they also sold drawers and shelves that fitted the module. But they changed the line to something new (and I just CANNOT remember the name of it), and again, you can customized the entire thing with shelves, drawers, doors and so on. 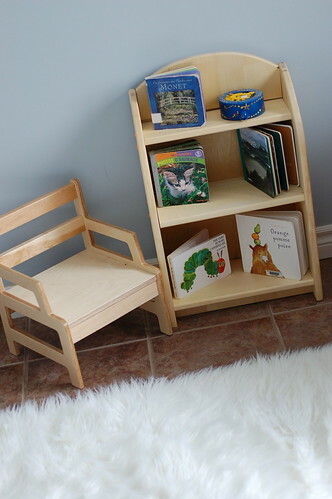 GO to the IKEA site, and search under the child section, you'll find what I am talking about, they are pushing this new product big time. I hope this helps. Don't hesitate to post any other questions you might have! 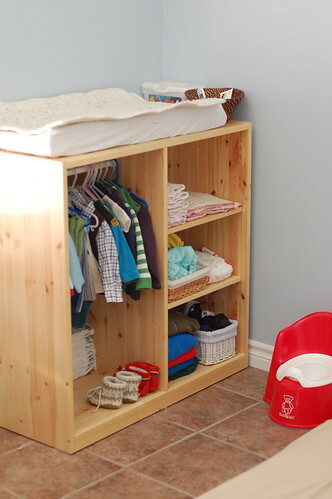 Did you add the bar yourself for hanging clothes in the Montessori closet? The IKEA module had the option of a bar to hang clothes. But it would have been easy all right to do it even if it wouldn't have been the case. IKEA doesn't have this line anymore, but they have an equivalent that also has a bar option for hanging clothes. Super chambre! 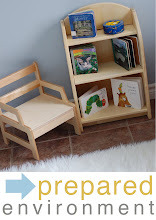 Je ne suis pas une éducation montessori pour mon fils de 10 mois mais je commence à lire sur le sujet, me renseigner. C'est un petit garçon très nerveux et excitable qui a du mal à se concentrer, alors parfois les exercices semblent impossibles à pratiquer! Penses-tu que cela puisse l'aider à se focaliser sur une activité, un objet? 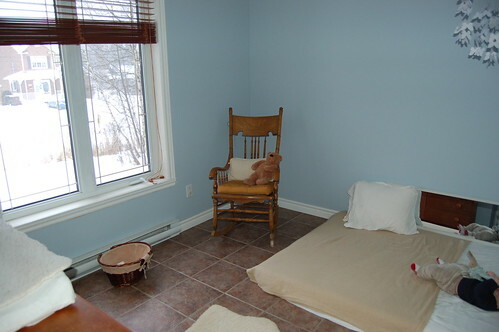 Autre chose: j'adore la petite chaise!! Où l'as tu déniché? J'ai connu la pédagogie Montessori en faisant des recherches pcq mon plus vieux semble être exactement comme le votre. Et honnêtement, c'est ce qui l'a "sauvé". Sa concentration est encore parfois ardue, mais Montessori l'a grandement aidé, plus que n'importe quoi que nous avons fait pour lui. Et c'est également une des raison pour laquelle X va toujours rester dans la pédagogie Montessori. Ça prend du courage et du temps, mais ça en vaut la chandelle! Ce qui m'a aidé le plus ce sont les livres qui traite de la pédagogie Montessori, en ce sens que j'ai compris comment la méthode fonctionne et ce que à quoi je devais faire attention. Il y en a tellement, j'ai de la difficulté à dire lequel m'a le plus aidé. Mais définitivement qqchose écrit par M. Montessori. J'ai, par contre, aussi fait d'autres lectures qui n'était pas Montessori, mais qui m'ont vraiment aidé aussi. Entre autre l'esprit dispersée de Gabor Mate, le programme Attentix à la maison (qui offre des suggestions d'activités pour "grounder" l'enfant et le calmer). Wow! This is just amazing! I wish I had a little bit of you organization skills to put everything together. 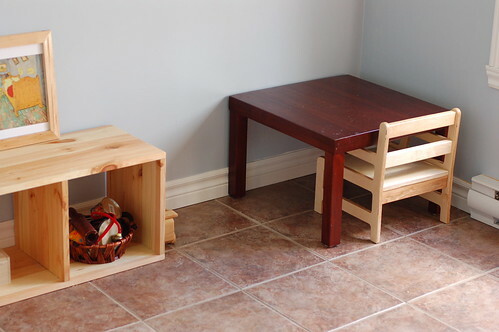 Could you please tell me where did you get the hand wash station, the pieces for the reading area and the pretend area? 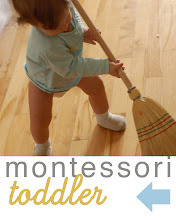 Also, I have looked at different Montessori posts but never done anything with them. I would like to start now. What would you say is the best place to start? I have a 3 1/2 yr old an 1 yr old girl. THe hand wash station was made with bits and pieces of things I had. The play sink part comes from a local Waldorf store, the table is an old geography cabinet, and the rest are material I bought at local stores. and the shelves were bought on Etsy. I tried to look through the things I bought, and couldn't find the store. I wish I could link for you. For the printed pay area, Again, it is a Ikea wardrobe with shelves and a rod. Again, the stuva line currently on sale at Ikea should be able to do the same. As far as starting in Montessori, I know how hard it might seem. But if you take it one bit at a time, it will go smoothly, and it will be worthwhile. 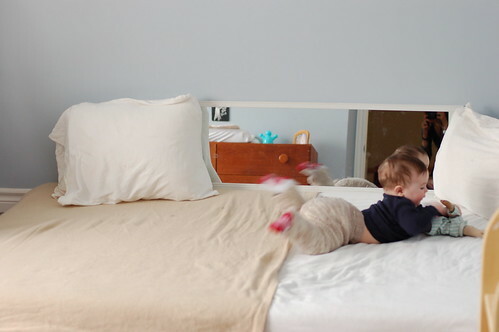 If you rather just start, you can either start by changing the environment, and make it more children friendly (there are loads of post about this in this blog! 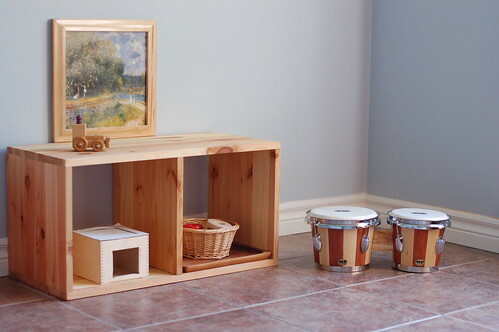 ), or you can start implementing Montessori activities in your home. But I think it is important to understand a bit of the principles that are supporting the Montessori philosophy before starting. There are many books and blogs about this. I can pinpoint you towards some resource, but I need to know a little more as far as where you want to start from in order to direct you properly. You can reply here, or send me a e-mail. Good luck in your journey. It is a fantastic one! Thank you very much for all the helpful information. I had just posted another comment in one of your other posts and you are actually giving me some of the answer here. I hadn't seen you answer before I posted it, I'm sorry. I'll definitely get book. Thanks again!